Cray Inc. (CRAY) Winner Amid Mind-blowing Supercomputer Demand? The human brain is an amazing thing. Every time we think, move or observe anything with any one of our senses (which is all the time), information shoots between the neurons in our brain at about 268 mph. When we’re awake, the electricity generated by our brain is enough to power a lightbulb. It’s also so complicated that it makes everyone unique. With almost 100 billion neurons and 40,000 connections between each one (called synapses), everyone has a completely unique pattern of thought. And lastly, if our brains were computers, they would be able to perform 1 quintillion (a billion billion) operations per second. That’s over 10 times faster than the fastest supercomputer on the planet. Back in 2009, a Cisco futurist said that in 2020, $1,000 will be able to buy you a computer with the raw processing power of the human brain. It turns out that he might not have been too far off. To give a little bit of history on supercomputers, back in 1985, the fastest one on Earth was called the Cray-2 supercomputer. It could perform 1.9 billion operations per second. That sounds like a lot, but it actually falls short of the power of an iPhone 6. Just over 30 years later, you can fit what would have been the world’s greatest and fastest technology in your pocket. Clearly, the ability to create computer processing power has grown exponentially since then. Now, the world’s fastest supercomputer is the Sunway TaihuLight, created by China. The speed of the TaihuLight is 93 quadrillion operations per second, or 93 petaflops. But what are these supercomputers used for? They’re more than just faster versions of our Dells and Macs. They can simulate reality by keeping track of huge amounts of information and variables at once. This is helpful for things like making weather predictions and even creating models of outer space. These computers are constantly in demand to run huge simulations that nothing else on the planet can do. Governments around the world, as well as elite teams of scientists, come to these supercomputer companies for all sorts of research projects that cannot be done any other way. Cray Inc. (Nasdaq: CRAY), which currently has the United States’ fastest supercomputer (called the Titan), says it receives hundreds of proposals per year from all sorts of organizations, and it has to filter it down to the top 40 to 50 to work on. Some of the top-growing fields in the world right now are artificial intelligence, space exploration and biotechnology, particularly precision medicine. And supercomputers can offer the power necessary to further bring these technologies to our daily lives. Just as we were back in 1985, we’re far from the limit when it comes to computing power. This is an industry that, with the current growth in technology, will keep growing exponentially. Another factor that could accelerate the growth of supercomputers is rivalry, particularly between China and the United States. In fact, there have been a couple of statements released by China and the U.S. that suggested even larger supercomputers are currently in the works. The United States plans to release a 200-petaflop supercomputer in early 2018. And China is working on one called an exascale computer that could be ready by 2020. An exascale computer is one that can perform 1 quintillion operations per second. Looping back to the beginning of this article, that’s the number that is estimated to be the processing power of the human brain. So while it may not cost $1,000 by 2020, the technology is already in development and could be fully operational by then. Also keep in mind that when the prediction by Cisco was made, the fastest supercomputer was only 2% as powerful as the Sunway TaihuLight. In other words, the top processing speed has grown by 5,000% in just eight years. The supercomputer business is expected to be a $33 billion industry by 2022. Because this is such a high-growth industry, there are only a few companies that are able to keep up with the technology enough to have a meaningful amount of market share. Two of the companies are Cray and IBM Corp. (NYSE: IBM). Cray has been an industry leader since the beginning. It had the top supercomputer in the world even back in 1985, and it still has the most powerful one in the United States. It’s the best pure-play stock that you can find in the United States for supercomputer investing, as it creates the computers as well as provides data analytics, artificial intelligence and data storage. Because it’s so concentrated in the supercomputer business line, it’s very unlikely that it’ll be beaten out in the industry. 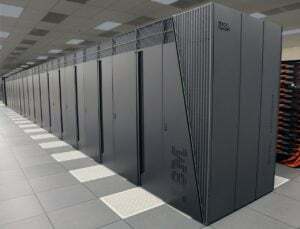 IBM is the company that is gearing up for the launch of its 200-petaflop supercomputer within the next few months. Although IBM does much more than supercomputers, it’s an area where it’s becoming more involved in. And due to the size of the industry, if IBM continues to grow in it, it will have a great impact on its stock price. The main point is that most, if not all superior technology nowadays is going to be first tested on supercomputers. And companies like Cray and IBM are going to have a ton of demand and opportunities to keep their products ahead of the market.